The Beatles 50 Years Ago Today: March 20, 1969. Beatles Radio: The Beatles, Solos, Covers, Birthdays, News The Fab 4 and More! John Winston Lennon and Yoko Ono are married at the British Consulate in Gibraltar (near Spain) by magistrate Cecile Wheeler. Beatles aide, Peter Brown, is there to act as witness. They had flown from Paris to Gibraltar early in the morning, landing on the “rock” at 8:30 a.m. The marriage took place at 9:00 a.m. 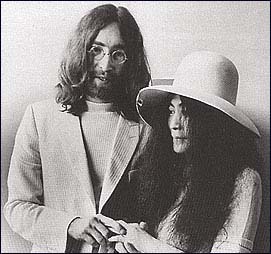 Afterwards, the couple posed for the official photographs (taken by David Nutter) with John in a white jacket, white turtleneck sweater and off-white trousers, and Yoko in a matching white mini-dress and huge floppy hat. They announce to the press that they will be staging many “events” and “happenings.” After the ceremony, they returned to Paris to their luxury suite at the Plaza Athenee Hotel. Said John, "We chose Gibraltar because it is quiet, British and friendly. We tried everywhere else first. I set out to get married on the car ferry and we would have arrived in France married. But they wouldn’t do it. We were no more successful with cruise ships. We tried embassies, but three weeks residence in Germany or two weeks in France was required."